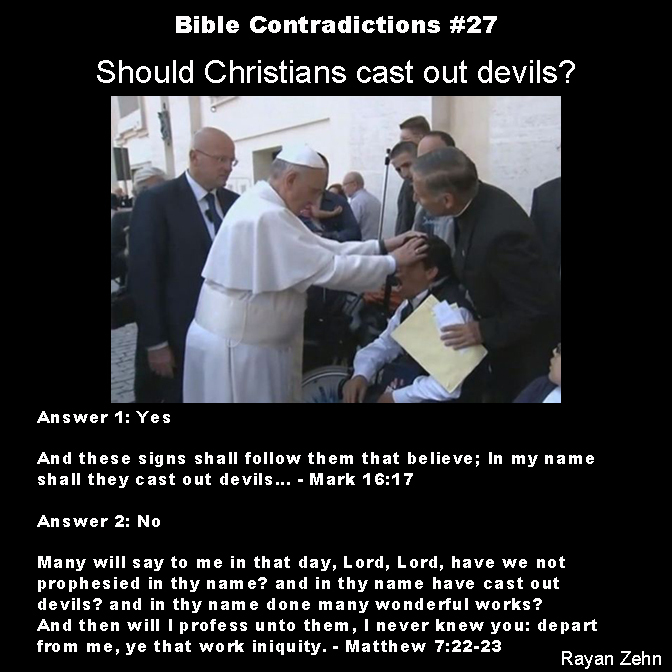 Bible Contradictions #27: Should Christians cast out devils? It seems everywhere I go those silly Christians are casting out devils. I can’t make it to the corner market without getting spritzed by holy water and having a lesson in Latin. But is it truly the Christian thing to do? According to Mark 16:17 it is. It is a sign of a true believer. Jesus is quite the fan of people who cast out devils in his name. But not so fast! There are two tales in Mark 9:38 and Luke 9:49 that tell a different story: Casting out devils in Jesus’ name should only be done by true Christians. “And John answered and said, Master, we saw one casting out devils in thy name; and we forbad him, because he followeth not with us.” Apparently doing Jesus’ work in Jesus’ name is not enough to be a Christian. You have to follow John too. Finally, Jesus changes his mind. In Matthew 7:22-23 Jesus makes it quite clear that if you cast out devils in his name, he’ll disown you. In other words you’ll go to hell. This is a very interesting verse here, because Jesus says that casting out devils is the work of iniquity. That is, it’s immoral mumbo jumbo. Even Jesus knew exorcisms were rubbish, yet, despite this, even followers of Christ still believe that devils need to be cast out of people. This entry was posted in Atheism, Bible Contradictions and tagged Atheism, Bible Contradictions, Christianity, Christians, contradictions in the bible, God, Jesus, Religion, the bible. Bookmark the permalink. 7 Responses to Bible Contradictions #27: Should Christians cast out devils? Latin hasn’t been the language of the Church for over fifty years, so clearly you’re a liar. And as usual, there is not contradiction expressed by your scripture quotes. In the second quote Jesus is reiterating the doctrine of grace, that is, our own works cannot save us. I hope you understood the joke there. Obviously people aren’t really throwing holy water at me and giving me incantations in Latin. If telling a joke is a lie, then my boss ought to fire me because I tell many jokes at work. Jokes are only jokes if there is some truth in them. Liars can’t tell jokes if their jokes are lies. And, Silence, would know because he’s been lying for his deity . Hey I just wanted to say thank you sooooo much for providing me with very easy lesson material for my powerpoint to show my students this sunday how vast the stupidity of atheists on the internet truly is… Thanks! I’m an atheist and this is obviously not a discrepancy if one assumes Matthew 7 is about someone lying about having cast out devils. The author is jsut embarrassing himself with this particular article. This is almost as bad as Sam Harris listing two verses RIGHT NEXT TO EACH OTHER about Goliath’s death as a “contradiction.”. Now the stuff about Jesus’ genealogy, or the size of the capitals on the pillars outside Solomon’s temple, or the length of the israelites sea in Egypt, or whether Jesus’ body was spiced before burial or not…the non-biblical stuff believers make up to rationalize those problems really ARE failed rationalizations of things that REALLY ARE errors in The Bible. I’m an atheist and this is obviously not a discrepancy if one assumes Matthew 7 is about someone lying about having cast out devils. Please don’t embarrass yourself. HTis is almost as bad as Sam Harris listing two verses RIGHT NEXT TO EACH OTHER about Goliath’s death as a “contradiction.”. Now the stuff about Jesus’ genealogy, or the size of the capitals on the pillars outside Solomon’s temple…the non-biblical stuff believers make up to rationalize those problems really ARE failed rationalizations of things that REALLY ARE errors in The Bible.